A positive work environment plays a key role in worker productivity and the success of a business. The goal with any office soundproofing strategy should be to maximize the sound values within the space, so that the employees perform at peak levels. One threat to premium sound quality within in office is blurred sound signals caused by excessive sound wave reflections off perimeter wall, ceiling and flooring surfaces. As the echoes in the room continue to bounce, the background noise combines to blur new sound signals, threatening communication levels, and spiking decibel levels. To restore the room to premium sound quality, and the key that unlocks the sound values you are seeking for soundproofing your office, lies in the capture and conversion of the echoes out of your room. The goal with your acoustical treatment is to improve the sound quality within your office by lowering your level of ambient echo. When you collapse the level of background noise, you raise greater clarity to original sound. This lowers the noise levels in your office and makes for a more productive work environment. Sound panels can be placed along the perimeter wall or ceiling surfaces inside your office space to effectively capture and convert these echoes from the room and deliver back the acoustics you are seeking. Care should be given to product selection, panel thickness, and coverage, which is why we built our Free Room Analysis Tool (see orange button above). Once you feed to us the dimensions of your office space, we can define your office soundproofing treatment and quote back. Office noise is a common soundproofing request we field every day. And for nearly every treatment we prescribe, the same sound panel: The Fabric Panel. Fabric Panels are decorative cloth wrapped sound boards that can be custom cut to size/color to be evenly spaced and flush mounted around the perimeter wall or ceiling surfaces of your room. The panels are highly absorptive and will combine to improve the sound quality in your office so long as the right amount of panel is introduced into the room. Fabric Acoustic Panels are available in 60 colors and are shipped with a set of clips that will make for an easy and cost effective self-installation. There are a couple of popular alternatives for how to soundproof an office. One would be our FabricTack Acoustic Treatment Panels, which double as bulletin boards, which would allow kids to tack up seasonal projects in your space. Another would be our PicturePanels that would allow us to print logos, emblems, mascots, artwork, graphics and more on your panels. Also, depending on your ceiling system, a set of VET Acoustic Baffles could suspend up between exposed joists. Any of these product options will deliver back premium sound quality, so long as we introduce the right amount of panel into the room. 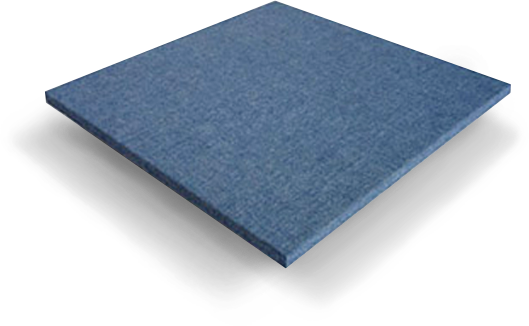 Fabric Acoustic Panels are the ideal sound panel treatment for controlling noise in an office space. They are class A fire rated, durable, decorative, easy to self-install, available in 60 colors, and can be upgraded to double as bulletin boards or have graphics printed on to them. They can be placed as you wish around the office space perimeter, wall or ceiling mounted, evenly dispersed with nice even site lines. This is the most popular acoustic panel that we sell, and have been at it for over 25 years. 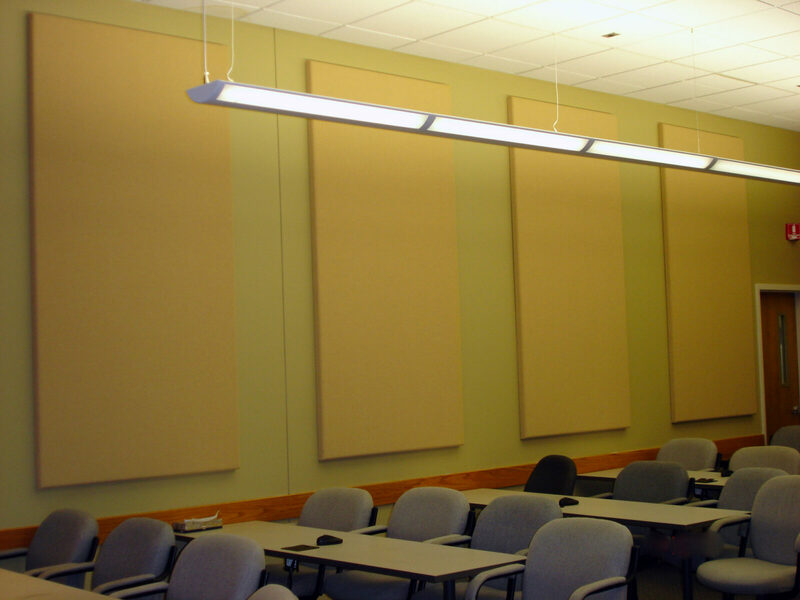 There are a variety of sound panel projects that we showcase in our Case Studies library. The soundproofing treatments showcased here will help give you the visual idea of what the panels might look like, as well as positive testimonials to reassure you that our sound panel applications do deliver results! New office designs often fail to take into account the sound values within a working environment and their impact on worker productivity. To properly soundproof an office space, the acoustic treatment will vary depending on the design. If employees are separated by individual offices, the goal is to soundproof common walls using the dB-Bloc layering system. However, if employees share a common workspace, the goal is to lower ambient noise levels within the office and control excessive background noise with a set of acoustic panels designed for office soundproofing. How Does a Loud Work Environment Impact Turnover and Absenteeism? Open office environments produce excessive noise levels that impede productivity. Research shows that the most destructive sound in an office is other people’s conversations. As a result, the inability to “tune out” neighboring voices can cause disruptive behavior and lead to employees not showing up for work or quitting. If you don’t learn how to soundproof an office, you can be left with costly consequences. Without effective office soundproofing, the negative impacts can prove to be significant. As noise fluctuates in an office, worker productivity will be compromised. People will strain to be heard and raise their voices. In turn, this will elevate the office noise exposure. Because of this, workers will be unable to focus and communicate, increasing the potential for error. Open office environments that have cubicles are cost-effective for a company. However, the downfall is a lack of office noise control. As individual employees raise their voices, the neighboring employees suffer from a spike in office noise. This renders an unproductive workday. Acoustic panels absorb the excessive echoes from a loud office environment. In turn, individual workstations will experience a drop in noise exposure as the echoes subside and productivity will rise. 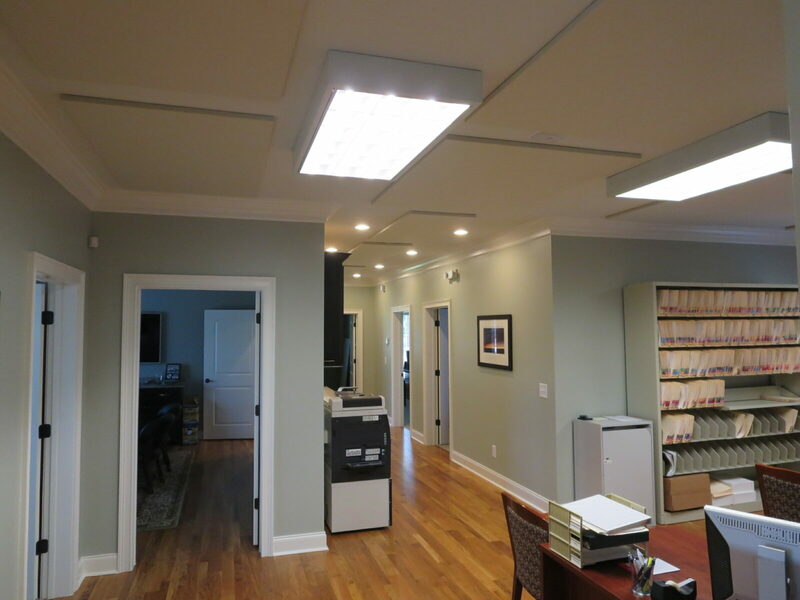 Office sound panels can be spaced evenly across the expanse of a ceiling, along the upper portion of the walls or as insets in the individual cubicles. Excessive noise in an office is softened by deadening the sound bleed, lowering noise levels that threaten worker productivity. To improve the sound values within an existing space, a set of sound panels can be retrofitted into the room. See our Fabric Panels. Once your office soundproofing project is installed, there will be fewer echoes and better control of your background noise, creating a more quiet and productive work environment for those sharing a common space. Common walls in a loud office environment are typically built with a single framing system and drywall. It’s the frame that’s your culprit. By connecting the rooms together, the frame inside the common wall allows structure borne vibrations to pass freely from room to room, similar to a string that’s pulled tight between two cans. Your goal will be to “disconnect” the framing in the wall and add “density” to the surface to impede sound vibrations. While this may seem like an overwhelming task, it really isn’t. Simply apply our dB-Bloc to your existing wall. Then, add a channel system, and finish with a new layer of drywall. With this application, you’ll force the sound waves to collapse and prevent them from passing through the walls. This will trigger up to a 90% collapse in the noise coming through your existing wall. See our Wall Soundproofing section for more details. Offices with existing ceiling tile grid systems and drop-in ceiling tiles often have walls that do not extend to the deck of the building. 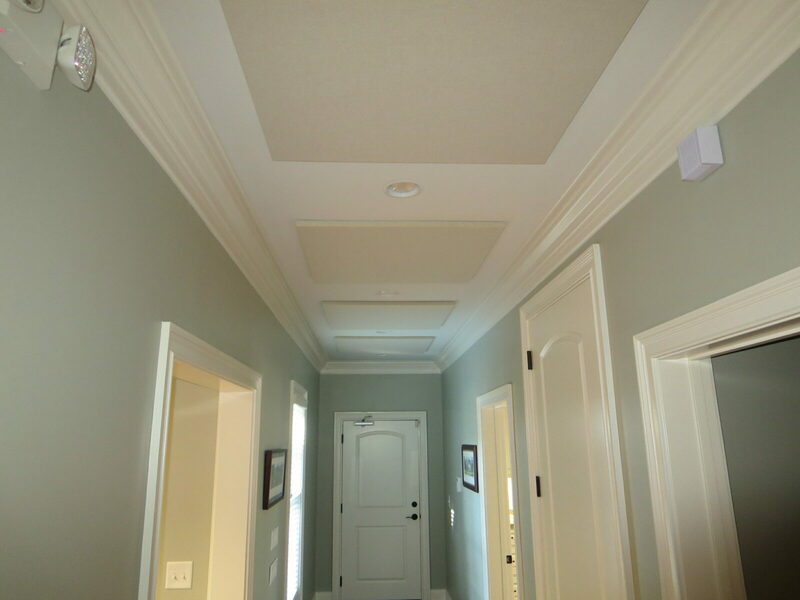 In these cases, noise can easily pass through the ceiling tiles from one room to another. To combat this sound bleed, simply add our dense Ceiling Caps. These are insulation plates that are cut to match your ceiling tile size that rest on top of your ceiling tiles to deaden noise bleed coming from the ceiling. Our StartSmart series is a simple email program designed to feed good information to clients that are concerned about controlling the costs their costs with their upcoming soundproofing project. This is a popular course with some good information for you. Sign up today! This (free) innovative tool helps define the scope of your upcoming sound panel treatment and quote your project back. The key to the success of your soundproofing treatment is to get the coverage amounts right based on the size of your Office. If we under treat the space, we leave too much echo in the room. Use this form to submit your room dimensions and we will quote your project back. Questions? Call 1-800-638-9355.